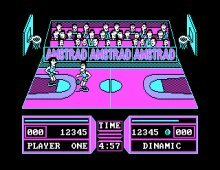 Basket Master is a simple one-on-one basketball game from premier Spanish developer Dinamic Multimedia. The focus is on pure, unadulterated action here: just choose one- or two-player game, and presto-- you'll be out on a CGA court trying to score (with the ball, of course [EG]). Although difficulty level can be toggled ("amateur" or "NBA"), needless to say the game is much more fun when you play against a friend. Controls are intuitive: bar charts at the bottom of the screen help you adjust the strength of your shots, although realism is kept to a minimal (e.g. the ball always bounces to the same height regardless of the throw strength). Overall, Basket Master is a decent diversion that doesn't aspire to be much, but is good at what it does.